Parks Associates has partnered with AVIXA™ to support the inaugural Integrated Life Day at InfoComm 2018 in Las Vegas. Integrated Life is a one-day thought-leadership event focused on the crossover opportunities between the commercial and residential audio/visual markets. The connected lifestyle is creating a variety of new experiences with technology that have crossover effects into all the contexts that consumers live, work, and play. This panel of industry experts explores the technology convergence across residential, enterprise, mobile, hospitality, and other commercial/public spaces, including the role integrators can seize in these expanding ecosystems. As the rapid adoption of connected consumer devices creates new experiences, there are new expectations for that same kind of seamless experience across all areas of their lives. Discovery and access to video in the home have become easier over time through innovations in devices, cloud services, new features, and improved user interfaces. Yet the AV experience in the business space often remains complex. Join industry leaders as they examine the innovations that are delivering premium, yet simplified, AV experiences in the home and in business environments as well as the partnerships necessary to accomplish this vision. Voluntary data sharing is critical to delivering the personalized and enhanced experiences made possible by fusing data from connected devices, sensors, and services; however, two-thirds of U.S. broadband households want “tight control” over their personal data. Keeping that control is increasingly difficult as personal devices often double for work purposes and vice versa. Panelists address the premium value proposition of face-to-face, consultative support, enterprise-grade security, end point monitoring, and privacy offerings for the home, including how integrators can offer managed services that work best in support of consumer security and privacy. Consumer expectations for entertainment experiences are transforming use cases and opening up new pathways to profitability through various forms of managed services. The majority of today’s smart home products are purchased as stand-alone devices, but they will need to work as part of integrated systems within the home and in hospitality, commercial, and other venues where the user goes. This session addresses new business available to integrators and how partnerships can help actualize these opportunities. Fifty-five percent of U.S. broadband households having a connected entertainment device are interested in controlling their devices with their voice. Voice innovations have already expanded consumer expectations for an intuitive interface. New applications of sensors, data analytics, and augmented reality will further redefine the UX with increases in interactivity, personalization, and personalized content. Panelists examine global trends in IoT and AV technologies to predict near-term trends in technology innovation and how companies/integrators can provide the best UX to consumers. 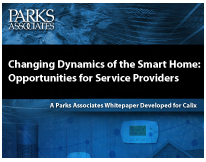 Physical and home security use cases always score highest when Parks Associates tests smart home value propositions: 67% of U.S. broadband households are interested in receiving alerts when someone enters their home. New smart technologies can enhance this value proposition. Sensor innovations are increasing range, IP cameras and smart sensors can add a visual data and interaction, and AI and analytics can contextualize the information. This session posits the next generation of innovations that will expand the connected home and how industry can prepare for these advances. U.S. broadband households will buy almost 55 million smart home devices in 2020, with the expectations that these IoT solutions will enhance their lifestyles and simplify daily home and work tasks. Learn what consumers expect when they acquire new IoT solutions and their interest in managed services that integrate new and existing products. Examine with these industry experts how product and system designers can anticipate and innovate in response to evolving consumer demands for work at home and on-the-go trends. Over the past few years, entertainment habits have shifted dramatically, ranging from streamed content to immersive interactivity. Today’s behaviors and preferences related to audio and video experiences are very different from habits of only a few years ago. New devices and greater interactivity affect perception of in-home AV needs for the newest generation of consumers and influences their expectations at hospitality, dining, or entertainment venues. This session examines the changing consumption habits of consumers and how those changes will affect all areas for AV products, services, and installation. John Anderson, CTO, AVidea Group, Inc. Growing up in the home of a CEPro 100 integrator, John has spent his whole life around home automation and home control. John became a founding member and product manager of the TiO home automation system, after leaving 3vNet. Now at AVidea Group, John is using his experience and talent to create fresh and exciting technologies in the new "iminate" product line. Abhay Bhorkar is the Director of Product Management at NETGEAR. He has a BE from Mumbai University in India, an MS in Computer Science from Iowa State University, and an MBA from the Haas School of Business at UC Berkeley. Abhay has been in the WiFi industry for the past 13 years, with a focus on consumer electronics. At NETGEAR, Abhay has been in charge of delivering cutting edge Nighthawk routers, as well as delivering services such as Circle Smart Parental Controls and NETGEAR Armor. He is passionate about working to reduce barriers in the adoption of new technologies, so that everyone can unlock the potential of their home network to the fullest. Vincent Bruno is a highly accomplished Senior Executive, Entrepreneur, and Thought Leader with more than 30 years of success in the design and installation, technology, consumer electronics, and product development industries. Leveraging extensive experience positioning organizations as industry leaders and negotiating M&As, Vincent is a valuable asset for startup to established manufacturing, innovate tech products for homes and business, IOT, and energy efficiency companies seeking expert assistance with analyzing new innovation tech products, developing go-to-market strategies, reputation enhancement, financial management, or M&As. His key areas of experience include engineering management, multi-media, product development, P&L, forging partnerships, technology, team building, and strategic planning. Vincent is a results-driven visionary with demonstrated proficiency at planning and building businesses from concept to operational to profitable established companies. Throughout his executive career, Vincent has held leadership positions with AlltecPro, VCOM, CEDIA, and Creston Electronics. He recently began working with AlltecPro, a division of VCOM as President. Prior to that, he was Chief Executive Officer of CEDIA®, the international trade association for 3,700 member companies that design, manufacture, and install technology for the home, luxury transportation, boutique hotels, and small businesses. During his tenure with the organization, he sold the CEDIA Expo Show to Emerald Expositions, formally integrated a licensed organization called CEDIA EMEA into CEDIA to create one global organization governed by one global Board of Directors, and rejuvenated the organization through aggressive marketing efforts. Vincent and his team produced nearly 300 collateral pieces including videos, blog posts, and consistent social media efforts which resulted in more than $2M in earned media relations in one year. Previously, Vincent was Board Director/Chairman for Integrated Systems Events (ISE), an organization that manages and develops leading trade shows and conference events for the professional audiovisual, systems integration and IT industries. Manufacturers, distributors, systems integrators, specifiers, and technology managers from more than 140 countries attend ISE events. Vincent holds a Master of Science, Management from Stevens Institute of Technology and a Bachelor of Science, Business Administration from Montclair State University. He is a well-known online educator, trainer, and sought-after keynote speaker. Vincent is former Chairman of the Board for Integrated Systems Events, and is a Board of Directors Member of Tower Products, an engineering and distribution manufacturing company. Sean Burke is a 25 year veteran of the high tech and consumer markets. Mr. Burke has held executive positions with world-class companies like Dell, Compaq, HP, Flextronics, and Nortek. Sean has been built multiple technology-driven businesses from concept to scale and profitability. Sean has demonstrated excellent operational execution across small and large organizations and has grown every business that he has led across his entire career. Sean recently worked at AMD and led the Professional Graphics business comprised of workstation and GPU compute applications. Sean made significant organizational, strategy, and product improvements to grow the business from $65 million to over $100 million in less than two years. Sean held the position of Group President at Nortek Inc, responsible for leading the Technology Solutions Group of companies which included the Security & Control and Automation businesses. Sean led significant restructuring, acquisition, and integration activities to grow the business and lead the Nortek Security & Control business to the number two position in security product market share. Under his 2 ½ year leadership, the Technology Solutions Group sales grew from $420 million to over $620 million, growing EBITDA from $29 million to over $65 million. Sean was the President of FlexComputing, a division of Flextronics International, responsible for high-tech design and manufacturing of PCs, servers, and storage products where he grew his business from less than $400 million to almost $6 billion in annual sales. Sean also created IMERJ Ltd. and developed highly innovative Android smartphone products. Under his leadership, this group filed over 300 United States Patents within a two year period, with over 200 U.S. Patents granted so far. Sean held several executive positions during his 12 years at HP Inc., including leading the Consumer and iPAQ product divisions. Sean created multiple new categories of digital products like wireless mobile devices, digital music players, and wireless music systems leading the organization to achieve over $1 billion in sales within two years. Sean also held the position of Vice President of Compaq Consumer Division for Asia and was located in Singapore from early 1997 through late 1999. Sean received a B.B.A. degree from the University of North Texas. Sean has also attended executive management programs at Harvard Business School and the London Business School. Chris Carradine is Executive Vice President, Business Development at ecobee where he is responsible for strategic partnerships for utility, commercial and OEM customers. ecobee was the first company to launch a WiFi connected thermostat and today is on a mission to create smarter products that are beautifully designed, easy to use, provide comfort and savings for families and are good for our planet. Chris has a long track record of driving strategic change to help organizations deliver on financial, social, and environmental performance targets. Prior to ecobee, Chris was Chief Operating Officer at Jantzi Research Inc., a top ranked investment research firm specializing in the performance of global securities with a social mandate. Chris also spent time at not for profit where he helped secure $50MM in funding to develop what is now recognized as the leading International Center for the Development of Cities. Chris has held other North American Sales and Marketing roles managing teams of 4 to 4000 staff. Vic has over 30 years of experience in high-tech. As an executive, he has been impactful in business development mandates and managing strategic alliances. He has held various senior positions, including Director of Sales of Matrox Networks, Director of New Business Media at Matrox Electronic Systems and VP of OEM Sales and Strategic Alliances at VuWall Technology. Rob Conant, CEO of Cirrent, has a long history in the Internet of Things and connected products. Rob was a pioneer in the Internet of Things as a co-founder of Dust Networks in 2002 where he ran sales and marketing for the company and set the product direction as the company enabled a new market for wireless connected products in the industrial markets. After Dust, Rob joined Trilliant to bring the benefit of connected products to the energy industry, where he delivered smart meters and energy management to millions of customers across the US, Europe, and Asia. Rob first ran the engineering team to ensure the company had market- leading products, then took the position of Chief Marketing Officer to drive the company's growth. Rob's deep technical background and business orientation gives him a unique perspective on the interactions between business models, technology, and consumers. Rob has a PhD in Electrical Engineering and a BS in Mechanical Engineering from UC Berkeley. Jennifer Davis is a creative and motivational marketing executive with deep leadership experience steering digital transformation through organic and inorganic business growth for both entrepreneurial start-ups and Fortune 500 organizations. Jennifer most recently served as the Chief Marketing Officer (CMO) of Honeywell's Home and Building Technologies (HBT) division in the Environmental and Energy Solutions (E&ES) business, where she lead innovation and growth in connected homes and connected buildings. As the Chief Marketing Officer (CMO) for the international business of Leyard and also served as the vice president of marketing and product strategy at Planar Systems and Runco International who experienced growth and business transformation. Prior to that she held senior marketing roles in SaaS businesses at Intel Corporation and an equity-backed start-up, Pierian Spring Software. Background includes P&L responsibility, business development, product strategy, brand management, as well as leading and inspiring cross-functional and global teams to high performance in growing organizations. She has a master's degree in business administration from Pepperdine University and a bachelor's in business and history from Warner Pacific College, where she has been honored as a distinguished alumni (February 2016), and has taken continuing education through Harvard Business School and McKinsey Academy. Jennifer has proudly served on the Leadership Search Committee for Avixa. Jennifer is a regular contributor on a number of influential blogs and publications and is a sought after speaker and lecturer. David Friedman is the CEO and co-founder of Ayla Networks, a leading end-to-end cloud platform for the Internet of Things. Prior to founding Ayla Networks, David served as Vice President, business development for ZeroG Wireless, a company providing low-power Wi-Fi products to the embedded space. In that role, David forged partnerships with leading micro-controller companies, and built relationships with OEMs serving a variety of markets including health, fitness, home controls and smart energy. Prior to ZeroG, David was an early employee at Matrix Semiconductor, serving in various sales and marketing roles before Matrix was acquired by SanDisk. In earlier roles, David helped drive pricing strategy at Intel, and was an analyst in the mergers and acquisitions group at Chase Bank. David has an MBA from the University of Michigan and a BA from Colgate University; he holds five US Patents. Arsham Hatambeiki, Sr Vice President, Corporate Product & Strategy, Universal Electronics Inc.
Arsham Hatambeiki has served as Vice President, Corporate Strategy & Product Development at Universal Electronics Inc. (UEI), since 2014, where he is responsible for developing and overseeing corporate technology and product roadmaps, including IoT product family for the Smart Home as well as strategic platforms such as QuickSet Cloud. Hatambeiki joined UEI in 2004 as a lead system architect for home connectivity, where he developed an ecosystem of home control products leveraging multiple connectivity solutions such as Z-Wave, ZigBee and Wi-Fi. In 2008, he became Director of Advanced Technology, responsible for innovation in advanced communication and technologies. During this time, Hatambeiki played a critical role developing numerous groundbreaking and award winning products (including 2017 Technology & Engineering Achievement Emmy® Award for work on Contextual Voice Navigation Technologies) and contributed to multiple wireless standards alliances including the ZigBee® Alliance and the Wi-Fi Alliance®. Hatambeiki holds a Master of Science degree in Computer and Communications Engineering from San Francisco University, and research background in areas of data communication networks and security, artificial intelligence and optimization algorithms. Bill Lally is the president of hospitality integration firm Mode:Green. A serial entrepreneur, Bill has extensive experience and a unique background in a variety of areas ranging from commercial audiovisual and control systems to energy management, broadcast, recording, post-production and hospitality. In 2008, the culmination of this experience resulted in the successful foundation of Mode:Green, which provides advanced control systems and energy management in the hospitality and commercial markets with the goal of bridging the current gap between integrators, MEP engineers and contractors, GCs, lighting designers and architects. Capitalizing on having become the first LEED-AP / Crestron Masterâ€™s Level Certified programmer, Bill grew Mode:Green from a small independent programming house (with clients such as Disney, Four Seasons, Baccarat, 1 Hotel and even NASA), to an enterprise completing several fully integrated multi-million dollar projects over the past five years. Mode:Green has become the foremost authority in meeting the demands of the luxury hospitality market and the ever-changing technology expectations of the worldâ€™s most advanced hotel guest rooms. Bill is on top of new technology trends in the latest and upcoming audio/video, energy management and automation technologies to use in work for his clients, and is a continuous technology tinkerer on the side. He was also a founding member of the STEP InfoComm Task Force and is part of the InfoComm Smart Building Task Force, which drew on his ability to create energy management solutions for commercial buildings. Bill attended the University of Miami for Music and Audio Engineering, and is a member of the US Green Building Council. As Crestron’s Technology Manager for Control Solutions and Network Infrastructure products, Toine C. Leerentveld spearheads the enterprise market for the industry’s global leader in automation technology. With over 20 years of experience in IT for high profile financial institutions like JP Morgan, Barclays, Chase, and Credit Suisse First Boston, Toine’s deep knowledge of networking infrastructure and security provides a strong foundation to lead Crestron’s charge in enterprise network solutions. Additionally, he served as a Lieutenant in the Royal Netherlands Navy in an IT management role. Since joining Crestron in 2003, Toine has led the development of Crestron’s leading edge .NET hardware platform, and helped to set up Crestron’s Network Interoperability Committee, which is responsible for setting Crestron’s security, communication, and deployment standards. He received his Bachelor of Science degree in Information Science from the Hogeschool van Utrecht, in Utrecht, The Netherlands. Jennifer is the CEO and President of Level Up Your Home, a national Smart Home Automation company specializing in bringing connected products into 25 US major markets for both residential and commercial clients. Prior to founding Level Up Your Home in 2016, for over a decade she led the Home Automation business unit at Bose which included the oversight of 100+ high end custom integration companies installing and selling products in the US and Canada. Her Blog, 60 Seconds of Smart has been awarded one of the Top Smart Home Automation Blogs on the Planet by Feedspot. Jennifer is an active member of CEDIA, AVIXA, NAHB, NARI, ESA and Women in CE. W. Edward (Ed) McConaghay currently serves as the Chief Executive Officer (CEO) of RTI, a leading control and automation manufacturer. Prior to joining RTI, he served as interim CEO and strategic advisor for technology companies through his consulting practice Key Indicators, Inc., which has been in business for more than 22 years. In that role, Ed has supported businesses ranging from startups to middle market companies, providing leadership and direction for business transitions, planning and implementing growth strategies, and developing technology products. Among his executive leadership positions, he was the interim CEO for WELLBEATS™; co-founder of PhotoBook Press; CEO and Director of XL Technology Systems, Inc.; CEO and Director of ViA Inc.; CEO and Director of Telident, Inc.; CEO and Director of Digital Technics, Inc.; and Senior Vice President, Sales and Marketing, of Deluxe Corp. He also served as Senior Executive at Nortel Ltd. for 10 years, most recently as Vice President of Marketing for the Asia Pacific region. Ed is a U.S. Military Academy graduate and served as a Communications Officer in the U.S. Army. He holds a Bachelor of Science in Engineering from West Point and a Master of Business Administration from Harvard Business School. Colin Morris is a director of product management for Adobe Analytics. Morris is responsible for business growth in emerging channels, including the strategy, roadmap, and solutions for analytics on voice assistants, mobile apps, connected car intelligence, and connected device/IoT. He’s focused on helping customers surface critical insights for driving business outcomes, better user experiences, and cross-channel customer intelligence. Colin has spent the last 9-plus years in the mobile space, building and managing apps, analytics tools, and ad networks, at Flurry (now Yahoo) and Goodshop. Prior to his mobile experience, Colin led product, content, and business development efforts across various startups in the ad tech, social networking and online media space. As Senior Director of Strategy and Workgroups, Armand leads strategy with a mission to foster collaboration among industry members working to improve technology that is critical to business operations in the globally connected era. Armand excels at bringing people and products together to create new technology solutions. Armand also focuses on enabling the HTNG workgroups to continue the tradition of creating educational content, solutions and standards. Armand received a bachelor’s degree from Vanderbilt University’s School of Engineering. A patent holding inventor, Armand has an extensive background in information technology and emerging technology, working for over a decade in the technology and hospitality industries. In his free time, Armand enjoys cooking with his wife, photographing his daughter's dance recitals and coaching his son’s hockey team. Sandhya Rao is the Principal Product Manager responsible for integrating Mixed Reality and Peripheral Solutions with Teams to serve the needs of Teams commercial customers. Previous to Microsoft, Sandhya spent 3 years at Honeywell leading and growing the Consumer IoT Software Solutions portfolio and before that she held various roles at American Express. She has 15 years of experience leading and digital and mobile product and marketing initiatives in the financial services and software industries. Sandhya holds an A.B. from Harvard University and an MBA from Yale School of Management. Avi Rosenthal has been in the connected device industry for over 20 years. He has held numerous positions in the industry, including Vice President of Security & Control for Nortek Security and Control, Vice President of Evolve Guest Controls, a company that developed the first retro-fitable guestroom energy management system for the hospitality industry, VP of Sales and Marketing for Superna, a home control manufacturer, the National Program Manager for On-Q/Legrand, a consultant to CompUSA and many other low-voltage integration firms around the world. He co-founded one of the largest Integration firms in the US. He is currently working with numerous start-ups developing the next generation of IoT. Prior to joining Audio Visual Design Group, Nathan had been programming control systems and designing user interfaces for nine years. In between projects he has obtained full certification from control manufacturers such as AMX and Crestron. Nathan's journey into AV integration was serendipitous after graduating from Western Illinois University in 2003 with a Computer Science degree and a minor in mathematics. He came upon a small but well respected programming house in Chicago where he honed his AV integration skills and was responsible for crafting standards and protocols within the programming division. Nathan has extensive experience in Military, Educational, Residential and Commercial spaces, some notable projects include: Loyola University, CNA, OSF Medical and the residence of LeBron James. Moving his family to the west coast in 2013 and joining the AVDG team, he looks forward to instituting processes that allow for timely implementation of top-tier AV systems and solidifying AVDG as the premier integration option to the world. Josh Srago, CTS is an award winning audiovisual professional. As an AVIXA volunteer he has served as a CTS representative of the Certification Steering Committee, as Adjunct Faculty for AVIXA educating on topics like tech policy and audiovisual system design. He works as a design engineer for TEECOM consulting group in the San Francisco Bay Area. Additionally, he serves as Editor-at-Large at AVNation.tv, is the founder of SoundReason.org, and writes for several industry publications. His pieces often focus on the effects of tech policy on the AV industry. In his career, Srago has served as a national training manager for a manufacturer, a tech manager for a corporate facility, and as director of engineering for an integration firm. It’s this diverse background that helps him understand all sides of the story and advocate for the best solution that benefits the client. You can connect with him on LinkedIn or Twitter. Mark Taylor is a Principal Technology Manager at Microsoft. In his current role Mark is accountable for ensuring global supportability of conferencing solutions across the enterprise, including standardization. Mark has been working in the AV/IT space for the past 10 years. In previous roles with Compass Group Mark led engineering teams which developed global standards and researched best practices for lifecycle management and space utilization. He also led AV project delivery and support teams at Microsoft. Taylor contributed to InfoComm International’s first edition of the Networked Audiovisual Systems. The book serves an on-the-job reference and a study tool for the Certified Technology Specialist exams. In addition, Taylor served for three years on the InfoComm Professional Education and Training Committee. Sean Wargo is Senior Director of Market Intelligence for the Audiovisual and Integrated Experience Association (AVIXA). He is the former Vice President of BDS Research and Director of Industry Analysis for the Consumer Technology Association. He earned his MBA from George Mason University and his B.A. in Sociology from the University of Vermont. Garry Wicka is Head of Marketing at LG Electronics USA Business Solutions where he leads efforts that support LGE's rapidly expanding B2B business in the United States. Wicka's responsibilities include end user insights, integrated brand and product marketing, digital marketing, creative development and agency management, marketing effectiveness, and experiential marketing efforts supporting the company's B2B business units; including display solutions for U.S. digital signage, small format monitors, lodging and hospitality, other areas including LGE's solar energy business. Wicka joined LG in 2015 and since then has developed the marketing foundation for various LG commercial business units which include CRM and marketing automation platforms, worked through a full digital transformation, creation of an industry leading partner program including a partner portal and digital assets library. He joined with two decades of marketing leadership experience in the technology industry, having held key sales and marketing leadership roles at companies like MCI and Dell Incorporated. Wicka is a graduate of the University of New Mexico where he received degrees in business administration and marketing and holds a masters degree in business administration and finance from the same institution. Paul Zielie, CTS-D,I is a multi-disciplined generalist with 30 years of experience designing and integrating IT, telecommunications and audiovisual (AV) solutions. Currently Mr. Zielie is the Manager of Enterprise Solutions for Harman Professional, a leading manufacturer of control and automation, system-wide switching and audio/video signal distribution, as well as digital signage and technology management. His primary responsibilties are solving the integration issues of enterprise wide AV integration including, security, scalability and maintainability. Prior to joining Harman in 2013. Mr. Zielie was a Principal Engineer for Lockheed Martin working primarily in Unified Communications and Network Video Transport.